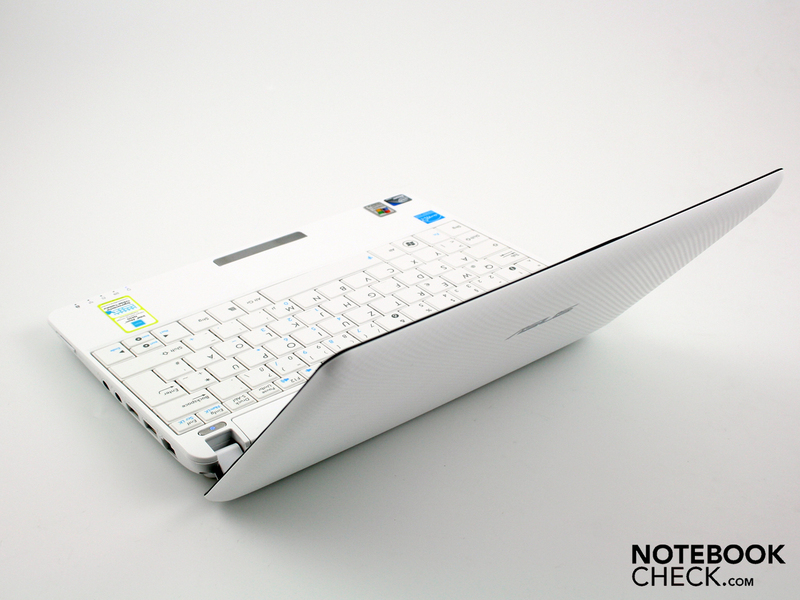 Asus churns out countless Eee PC models, but the 1001P stands out from the crowd. Its matt display, matt surfaces and low price of €249 are enough to make the competition weep. The netbook uses the latest Pine Trail platform, and just runs and runs. With such low energy consumption and low temperature gain, it shows us what the new Intel chipset is capable of. 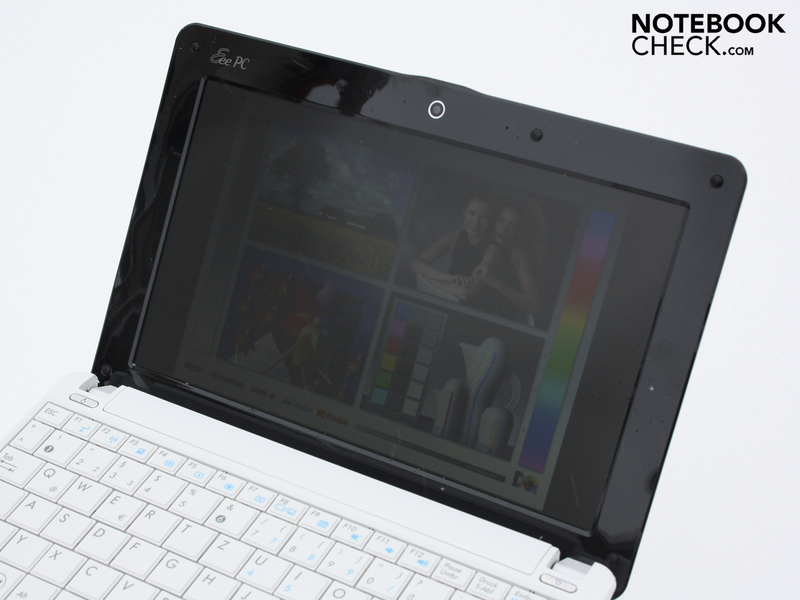 Read on to discover if this really is the last word in netbooks. Things are moving quickly. The first netbooks based on Intel's Pine Trail platform were revealed at the CES in Las Vegas at the start of January. And now, only a few weeks later, the shelves are stocked with new models from Asus and Acer, waiting to be snapped up by eager customers. 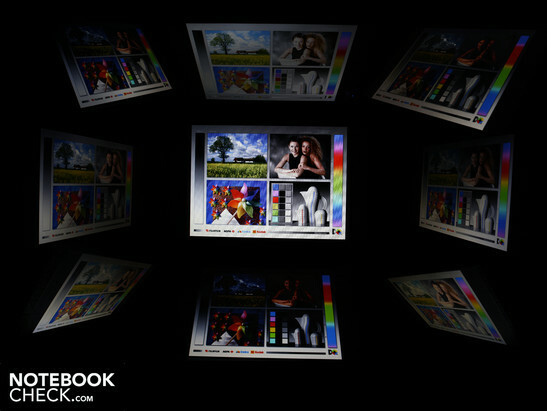 Potential buyers can look forward to consistently low prices for the new mini-notebooks. Despite the new technology, manufacturers have not dared to put the prices up. This 1001P costs an affordable €249 in the shops and online. The 1005PE that we recently tested costs €299, for which you get a larger 250 GB hard drive and also Windows 7 Starter as the operating system. So how much netbook do you get for so little money? Our first impressions from the quality of workmanship and the matt display seem to point in the right direction. Is the 1001P the perfect travelling companion for every situation? Find the answer to this question and more in our review. 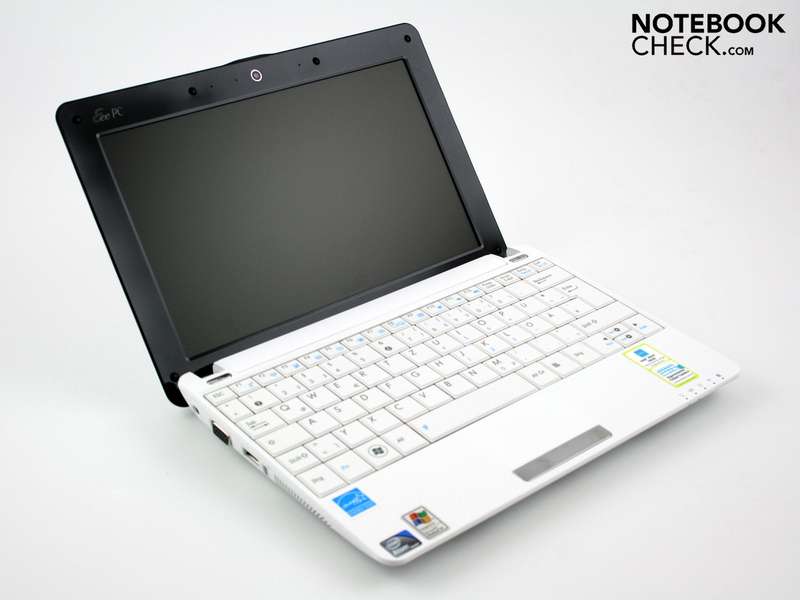 The Eee PC 1001P comes in white, black and blue. 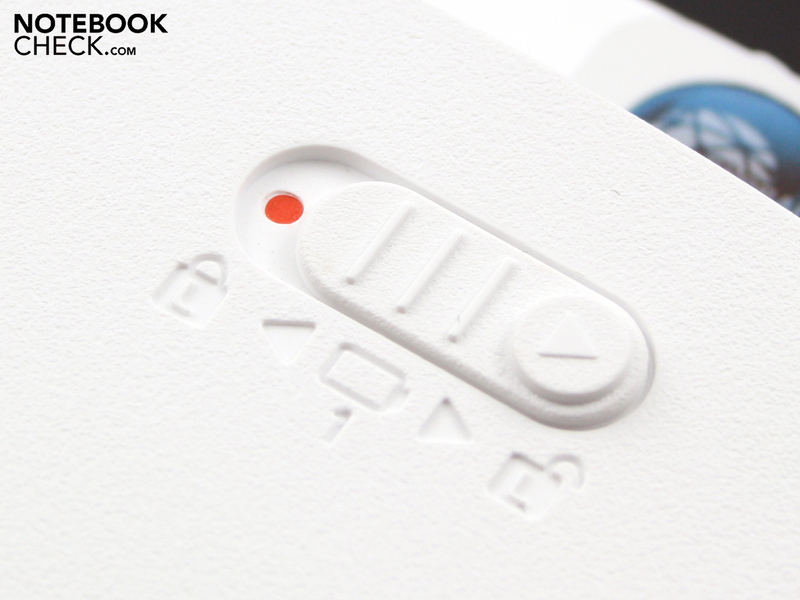 We opted for the smart white colour, to test how dirt-resistant the matt plastic surfaces are. After all, the 10-inch 1001P can sit quite literally on the palm of your hand. Sweat, grease and moisture will quickly find their way onto the matt underside and patterned matt top. Anyone who has looked closely at their keyboard or mouse after a year of use will know how plastic surfaces can become yellowed with dirt over time. We tried using the netbook with deliberately dirty hands. The underside is particularly liable to pick up dirt. This is not easily avoided if the netbook is to be used on the go, since the case always has to be picked up and carried around. But the real problem is not that it gets dirty, as this happens to all notebooks to a greater or lesser extent. What is problematic is the cleaning. 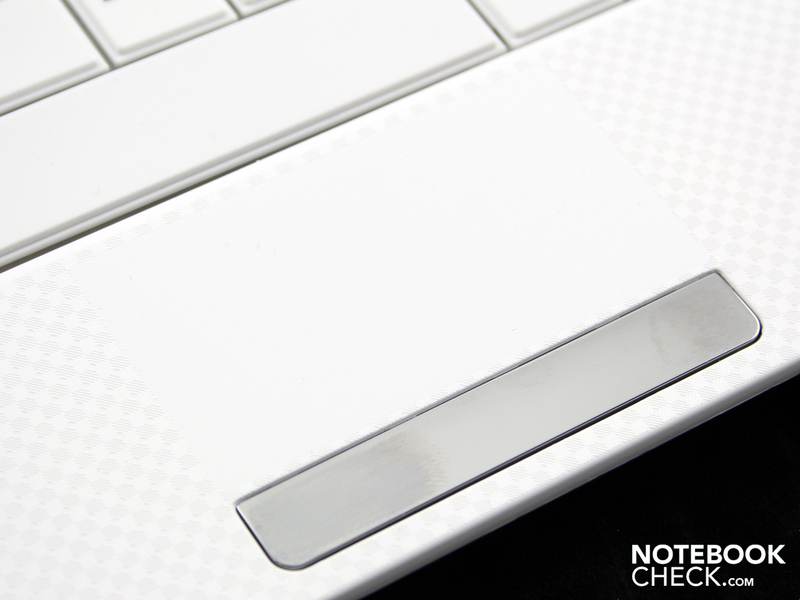 A polishing cloth, of the sort that is included with many high-gloss laptops, does not work very well on a matt surface. But on the other hand it should be noted that the lid and palm rest area, which are covered with a textured pattern, are more resistant to dirt than the underside. The 1001P's case is robust, particularly when the lid is closed. Picking it up with both hands, we could not bend it at all. Flexing the lid itself is a little easier, but even this is unusually rigid. The lid only gives way at all when considerable force is applied. 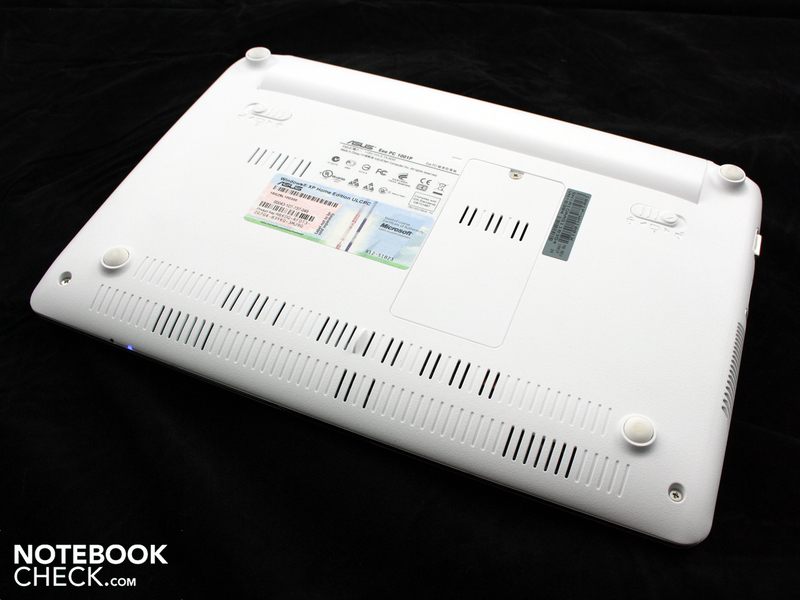 The underside of the netbook is similarly robust. We could only push down the middle area to the right of the memory access panel. However the case is not as robust when you remove the tightly fitting six-cell battery. The hinges are stiff, but do sit a little loosely in their settings. It takes both hands to open the netbook. It opens to a wide enough angle for you to be able to view the screen comfortably in the car or on public transport. 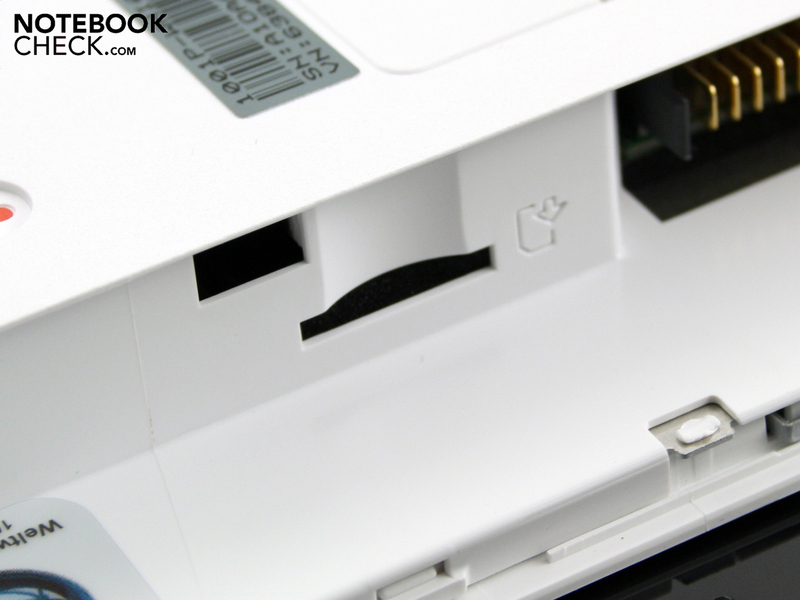 The centre of gravity is in the chassis, so the lid does not overbalance the netbook and tip it off your lap. The ports are most certainly a limited affair, typical for a netbook. On the right-hand side, next to two USB ports, there is an ethernet port for a network cable. Towards the front of the right-hand side there is a card reader, as well as the audio ports. The USB ports have a Sleep & Charge recharging function for mobile phones and iPods. The left-hand side has a VGA connection and a USB port. Those who are afraid of losing their 1001P to thieves can chain it down using the Kensington lock slot. 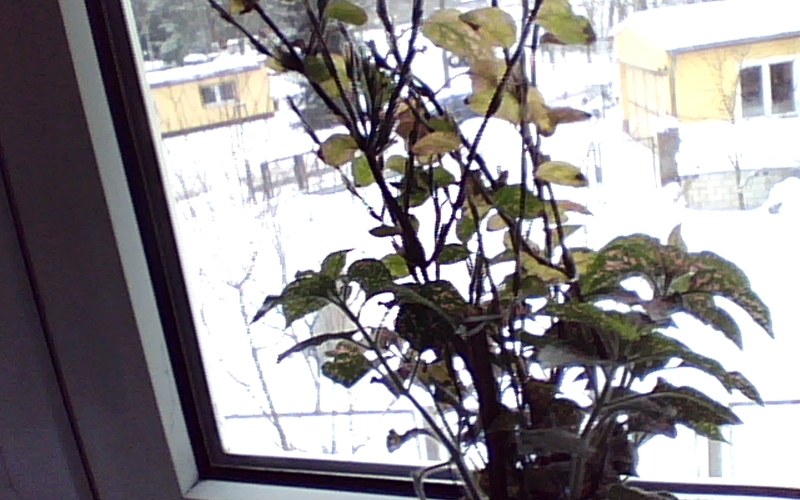 The VGA webcam (640 x 480 pixels, internally connected via USB) does not deliver balanced colours, even in good lighting conditions. The noise on the test image we took is very pronounced; the colours are washed-out and not true-to-life. It can only record videos in 320 x 240 (QVGA) format, and the videos it takes are not good enough quality to be shown on YouTube. Also the camera cannot take 25 frames per second, which would be the minimum necessary for judder-free videos. However if you just want to use it for quick webcam chats over Skype, you should be able to make do with the low quality of picture. The Asus Dock is an application which sits along the top edge of the screen. 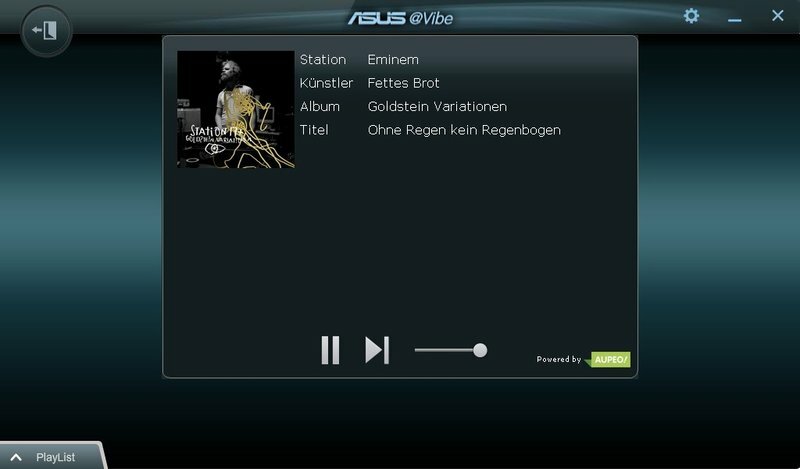 It allows the user quick access to various items which are mainly to do with entertainment (Asus @Vibe, internet games), programs (Asus AP Bank), data (Data Sync, EzMessenger) and settings (screen contrast, updates, font size). Interestingly Asus also uses this Eee PC platform for selling software. Through Asus AP Bank (whose name seems to bear little resemblance to its function) you are directed to an online shop of the same name, where you can buy learning tools, office software and tools which are geared towards the generally weak hardware of the Eee PCs. 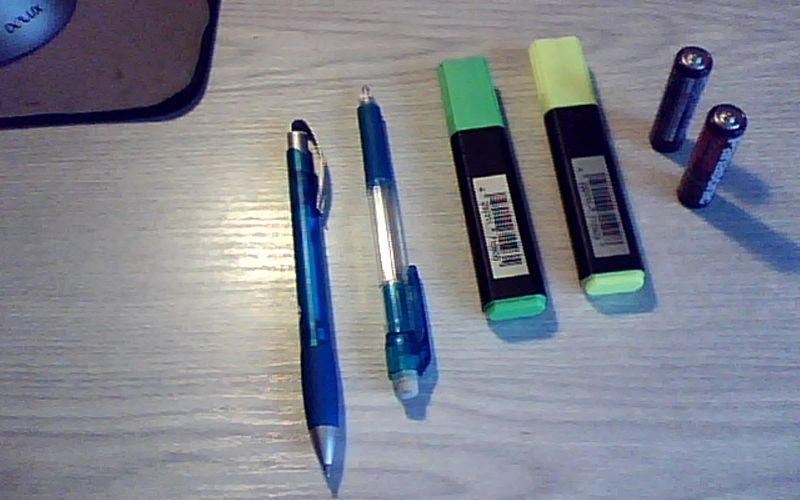 10-inch netbooks are always going to have difficulty in this area: there simply isn't much space. A comfortable, roomy keyboard is lost in the quest for portability in a 10-inch machine. Nevertheless, Asus have put in a lot of effort and created a serviceable, though not perfect, keyboard and touchpad to fit in the limited space. 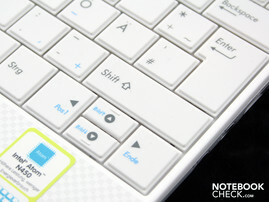 The square-edged keys depress to a good depth and give clear feedback, but with a slightly spongy feel in some places. 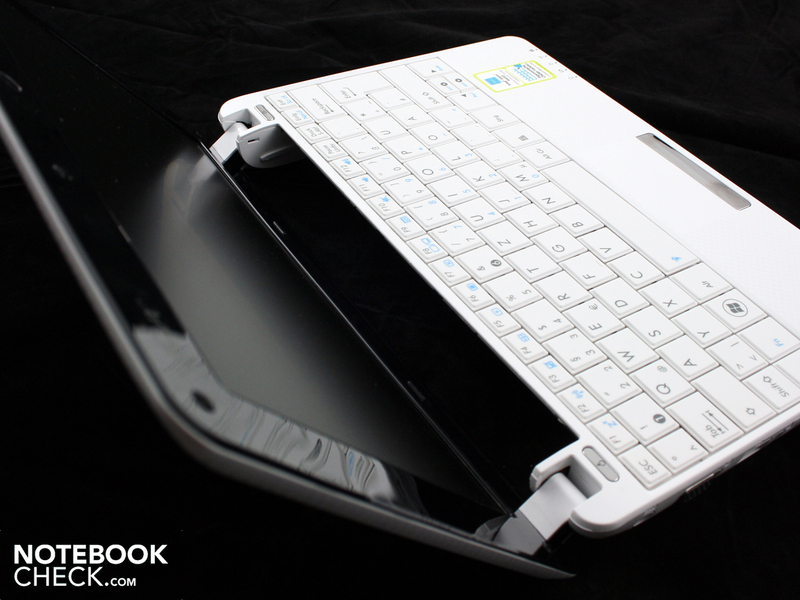 This is the case on the left side of the machine, where the surface of the keyboard can be made to flex. The chiclet-style keys are close to one another, making it hard at times for your fingers to differentiate between them. This leads to frequent typos whilst you are getting used to the netbook. But this is practically unavoidable on this size of machine. The Synaptics touchpad (V7.2) is customizable in many ways. It recognises multi-touch gestures, for instance scrolling with two fingers or the three-finger flick, which allows you flick through photos or move forward or back a page in your web browser. The point of the gestures is generally to save you from awkward navigation using the scroll bars. The surface of the pad, which is sensitive right up to the edges, is pleasantly matt. It has horizontal and vertical scroll bars, although they are not marked. The touchpad buttons do not depress much at all and respond too firmly. This means the user has to give the chrome-coloured bar a relatively hard press. However the click is practically inaudible. Since Christmas 2009 Asus has been using matt screens again, and so we find one on this Eee PC 1001P. The 10-inch WSVGA display's native resolution of 1,024 x 600 is standard for a netbook. But the surprisingly high contrast ratio for this matt screen is above average. We measured 847:1 with a maximum brightness of 127 cd/m² (in the middle segment). However the ICC profile shows a limited colour space. Using the analogue video connection (VGA) you can connect up an external monitor or TV (with an adaptor). It would have been nice to see an HDMI port for higher resolutions, but these are very rarely included on netbooks. The screen brightness is unusually poor for a netbook. We measured a maximum value of 127 cd/m² in the middle segment in super-performance mode, with mains power. Asus has a sad tradition of artificially limiting the LED backlighting on its Eee PCs. Screen brightness is a drain on the battery, and of course Asus would prefer their netbooks to achieve new record run times and receive glowing reports about their battery life. 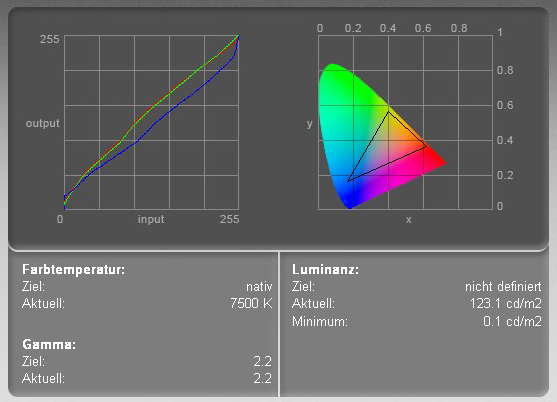 Earlier Eee PC models, like the 1000H, allowed you to get round this limit on the brightness using the free eeectl tool. Models that had previously been limited to around 130 cd/m² were then able to reach brightnesses of 250 cd/m². But this does not seem to be possible with the 1001P. The eeectl software (version 0.2.4) does not respond to our attempts to make adjustments. When on battery power, regardless of what performance mode you are in, the brightness sinks still further to a maximum of 113 cd/m² (middle segment). Asus has done the right thing and chosen a matt display. 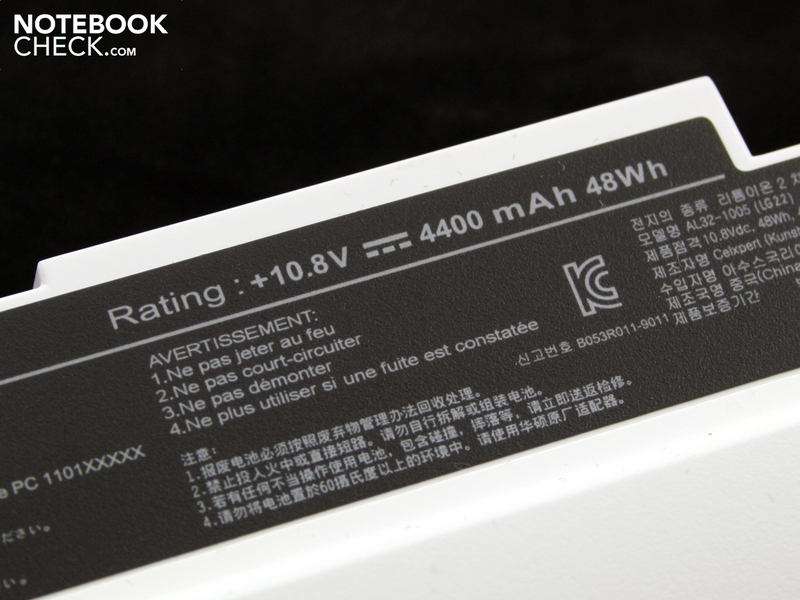 However, the low brightness of 113 cd/m² while on battery power means that outdoor use is not really an option. Even on the cloudy winter's day on which we took these outdoor shots, we were only able to read the screen with great difficulty. If direct sunlight were to be added to the mix, the user would see nothing but a dark screen. The poor viewing angles also limit your field of vision, in all lighting conditions. 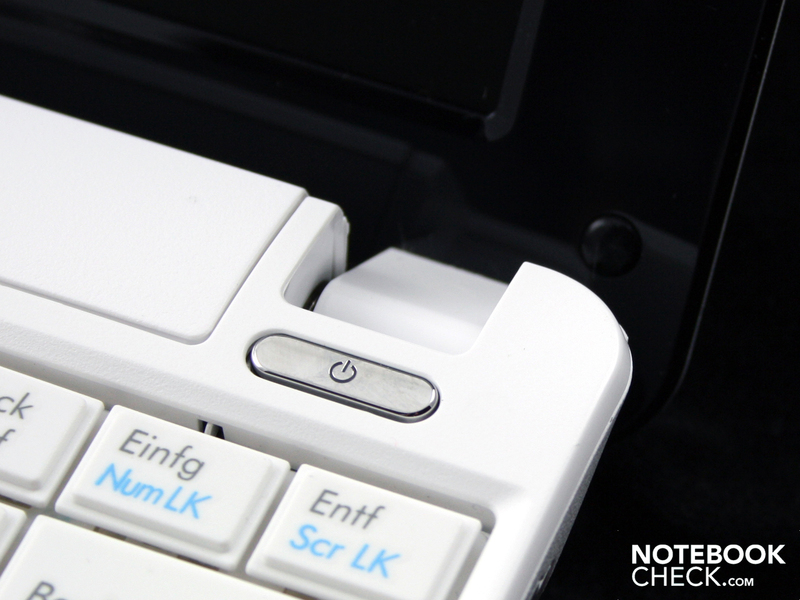 The Eee PC 1001P's horizontal viewing angles are acceptable up until about 45 °. As long as the lighting is not too bright (indoors), text remains readable and colours are only slightly distorted. However we did notice that the already dim screen began to darken still further at around 20 °. 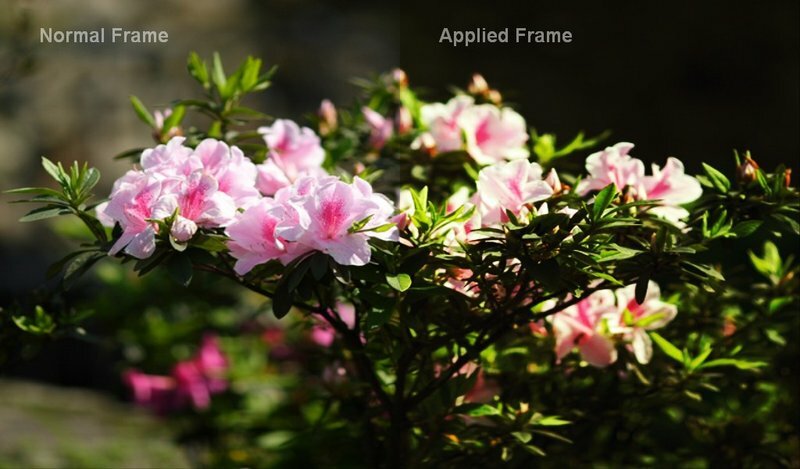 You can see this clearly on the image of viewing angles below. Vertically, the eye of the observer can deviate by 10 ° before the picture starts to darken a little. At a 45 ° angle, so essentially the view from above, the colours were completely inverted and the screen was very dark. 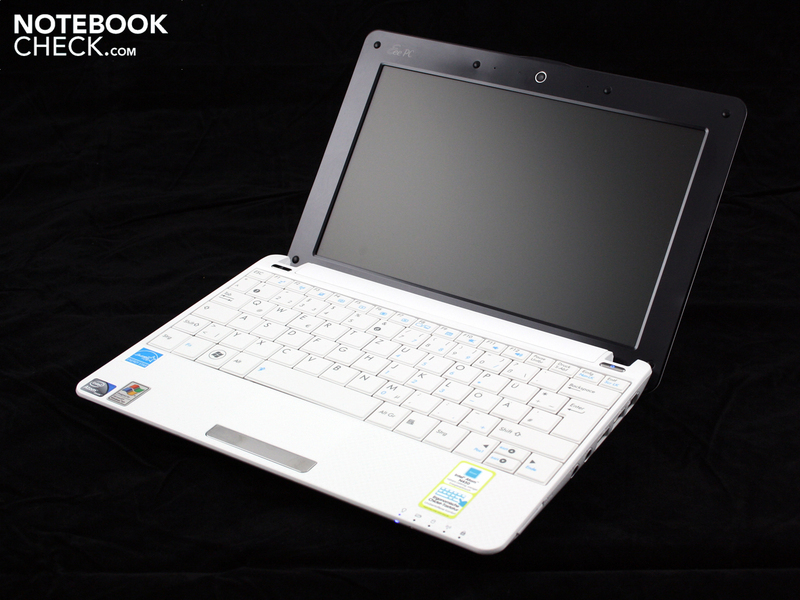 The Asus Eee PC 1001P is equipped with an Intel Atom N450 processor (1.66 GHz) with integrated GMA 3150 graphics. The graphics core does not have its own memory. The processor has a small L2 cache of 512 KB, like its Atom N270 and N280 predecessors. The FSB is 667 MHz. The platform as a whole is known as Pine Trail in professional circles. The performance specs have barely improved in comparison to the previous Atoms. Intel's hyper-threading technology gives applications access to a second, virtual core, but this was also the case for the previous netbooks. Hyper-threading enables a single-core processor to cope with a multitasking operating system despite low performance components. Windows XP Home comes pre-installed, the classic OS for netbooks thanks to its low demands on the hardware. 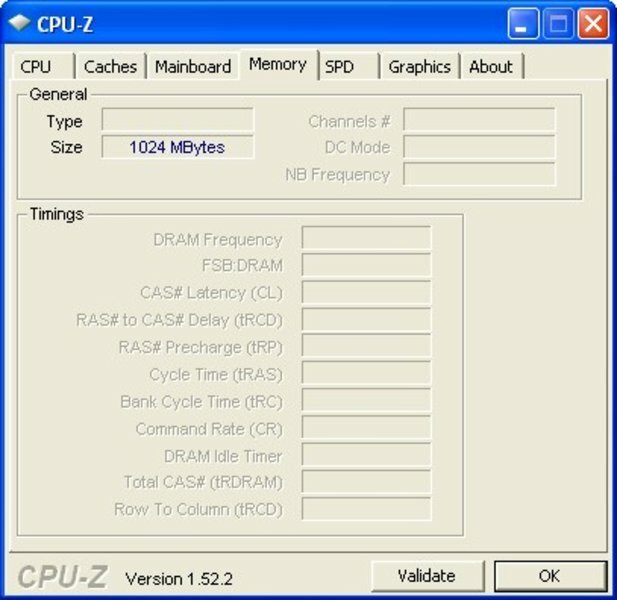 The CPU is assisted by the 1,024 MB of DDR2 RAM as well as a 160 GB Hitachi hard drive (with 5,400 rpm). 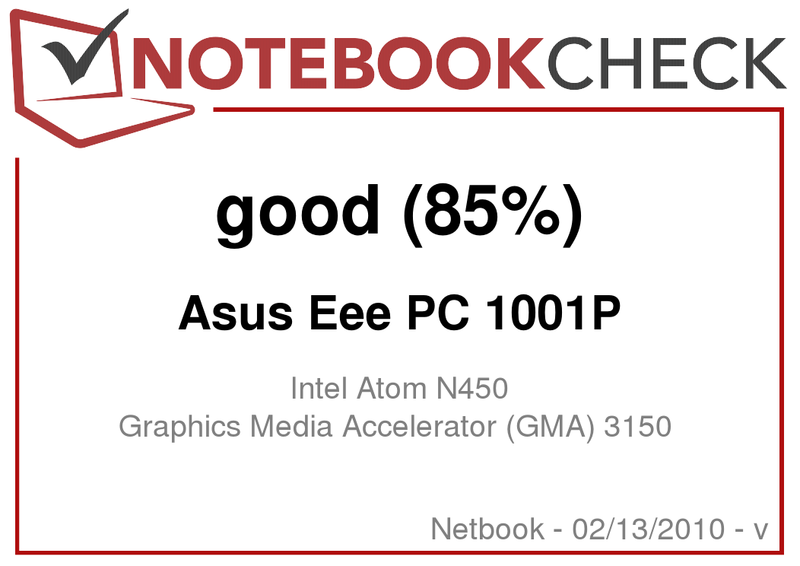 Graphics performance is all but non-existent for this second generation of netbooks with the Intel GMA3150. The DirectX 9 GPU is integrated into the processor and does as little for 3D gaming as the GMA950 and GMA500 before it. It finishes the 3DMark06 benchmark with 141 points, for example; modern entry-level gaming notebooks with weak dedicated graphics cards achieve between 5,000 and 6,000 points in this test. The strongest integrated graphics card, Nvidia Ion, achieves around 1,400 in the 3DMark06 test, depending on the processor. Asus Splendid raises the contrast - but high-resolution videos (from 720p) still judder on the 10-inch screen. The 1001P is not necessarily very good for those wanting to watch videos online or watch films. 720p encoded videos (H.264 codec), which should look very good even on the 1,024 x 600 screen, generally will not run without juddering. Depending on the data format, videos may run more smoothly in super-performance mode. A trailer for Mafia 2 in WMV format (720p) ran smoothly, for example. 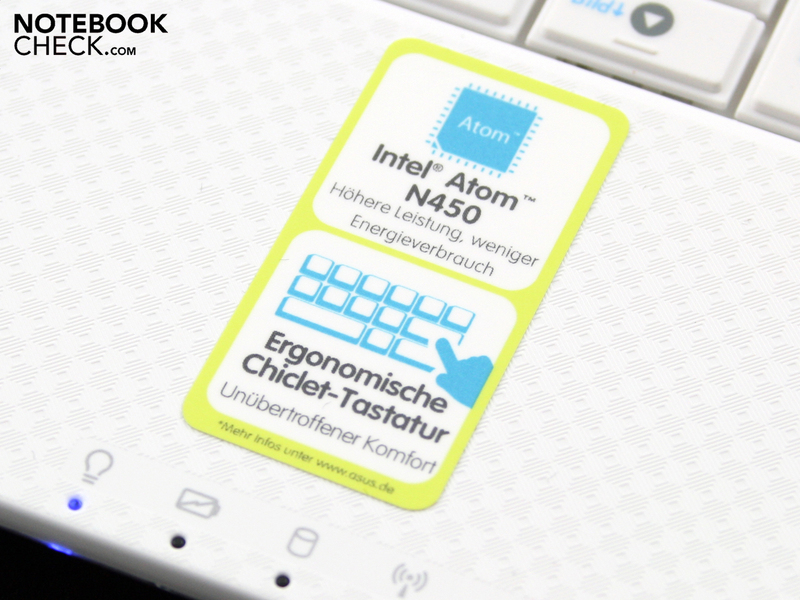 Mostly the weak Atom N450 is overburdened, since it does not have a dedicated GPU to help it out with the decoding. Other netbook manufacturers have already found a solution to the HD problem. For example some have added the Broadcom Crystal HD chip (H.264 decoder) to the Pine Trail platform. 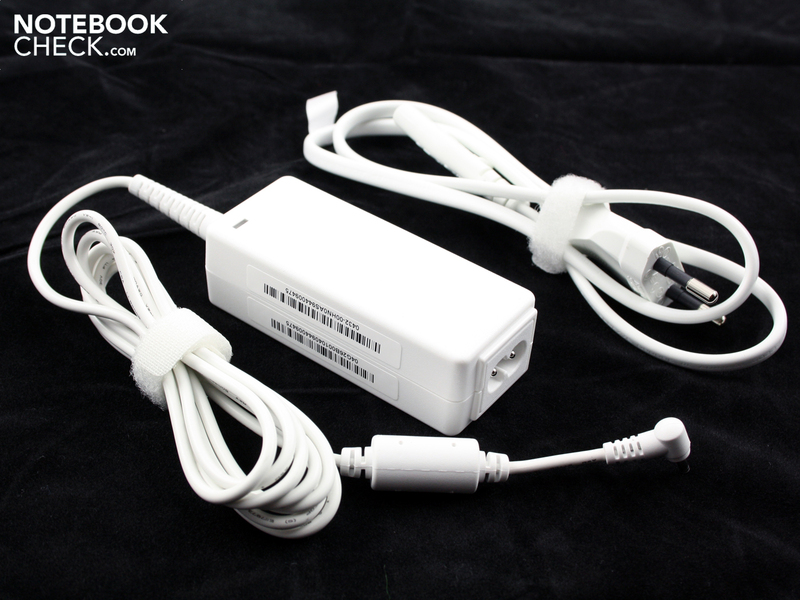 With this additional chip, 1080p videos can be run smoothly even when on battery power. 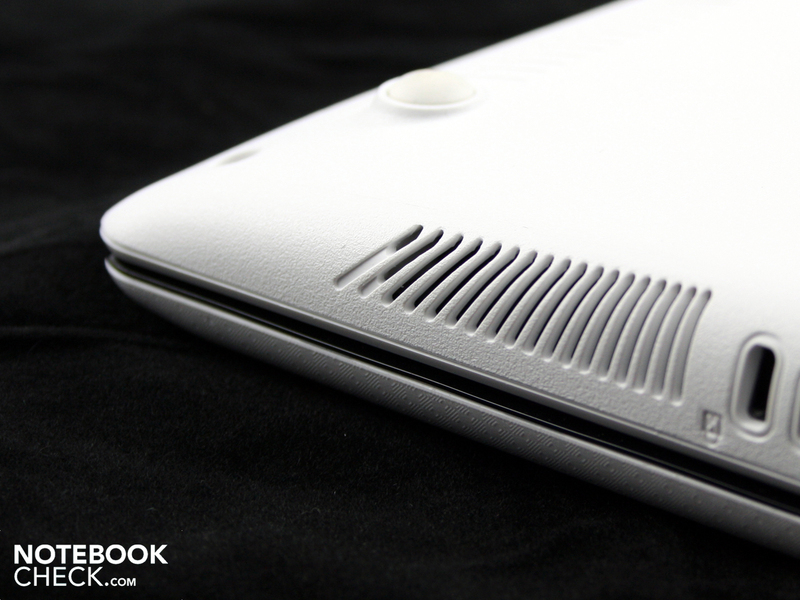 For more information see our review of the Dell Inspiron Mini 1012. 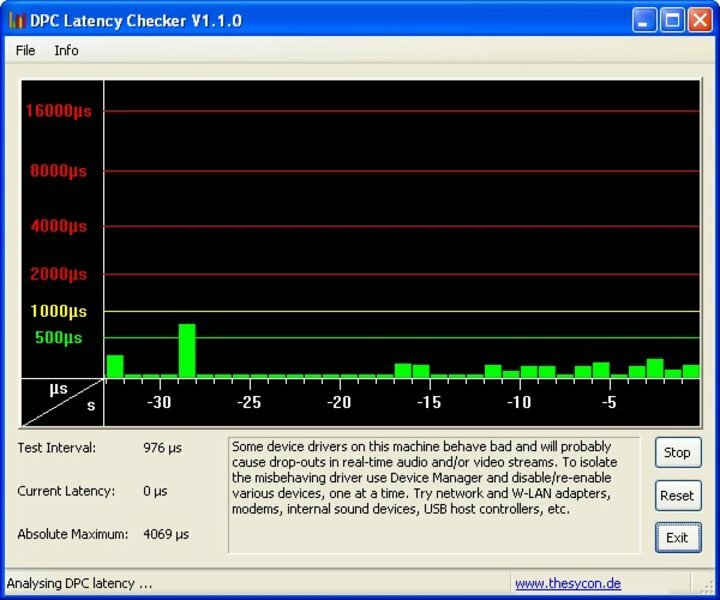 We tested the latencies (time delays) under Windows with the DPC Latency Checker program. If these are too high it can lead to problems when you connect external devices (for instance you can experience crackles of sound when using external sound cards or short interruptions in real-time audio). At first glance the 1001P seems to have sailed through this test: the latency levels look to be fine in the graph created by the DPC Latency Checker tool. However, as soon as we started working with the mouse and the hard drive became active, delays appeared of just over 2000µs. 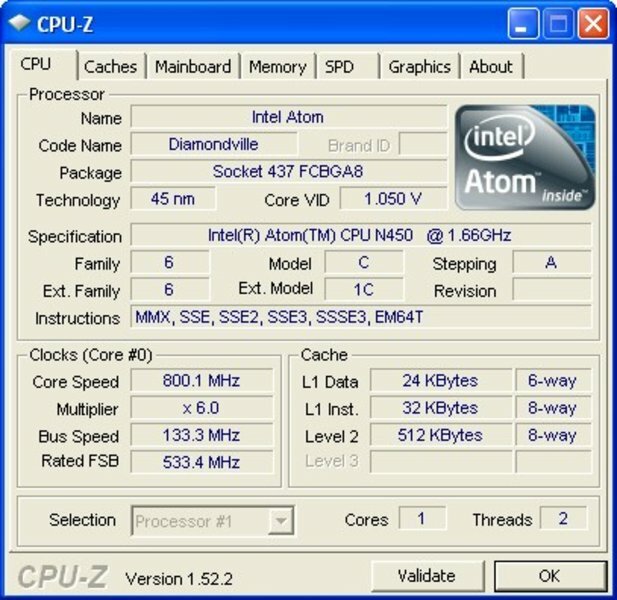 The processor benchmarks confirm that the 1.66 GHz Intel Atom N450 delivers low performance that is typical of a netbook. We could not run the PCMark Vantage benchmark, which is for testing the system performance, due to the lack of Windows Vista or 7. Even PCMark05, which is suitable for Windows XP, stubbornly refused to cooperate. The benchmark ran from start to finish but did not produce any results. It is helpful to analyse what the application performance felt like in Windows XP. In high-performance mode folders, files and new applications open with a small but noticeable delay. The delays grow more pronounced as soon as you have several applications open at once. Having the Media Player open, along with five tabs on a browser, whilst writing emails in Thunderbird? This set-up produces aggravating delays. It feels sluggish compared to a notebook. Whether users will be able to put up with the low performance of the system depends in the end on what they want to use the netbook for. Wirelessly surfing the net and reading emails is never a problem. 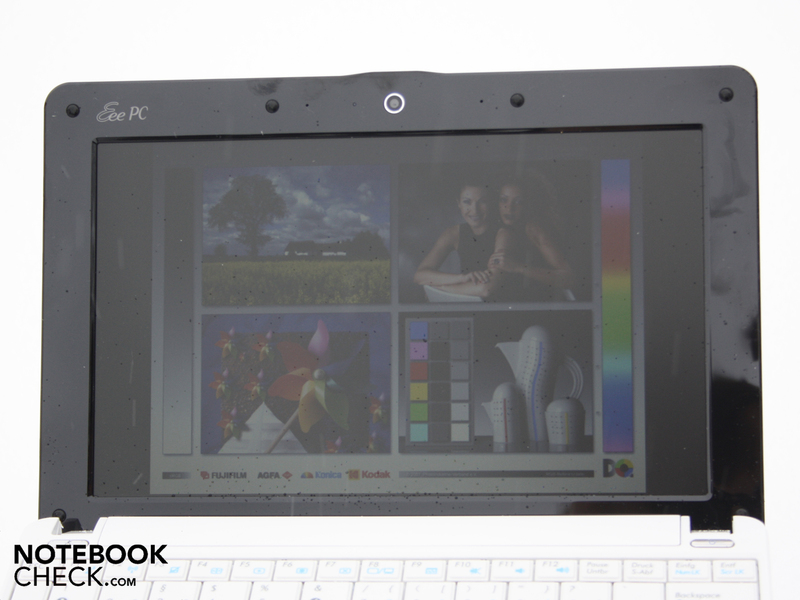 But the Asus Eee PC 1001P is no substitute for a notebook. The Hitachi hard drive (type HTS545016B9A300) has a capacity of 160 GB and only achieves a below-average data transfer rate in the HD-Tune test. 48.3 MB/s is no longer a good rate in the sequential read test for a modern 2.5-inch hard drive. 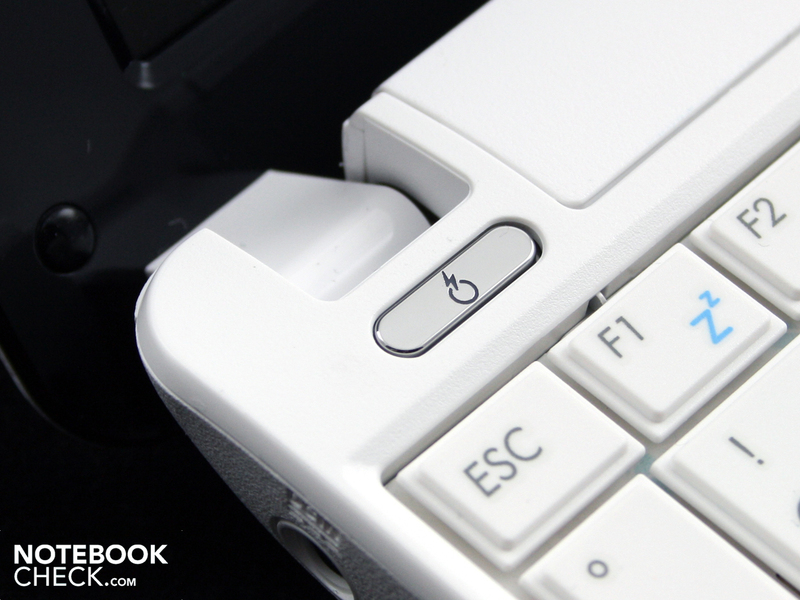 A positive feature of the Asus Eee PC 1001P is its low system noise. 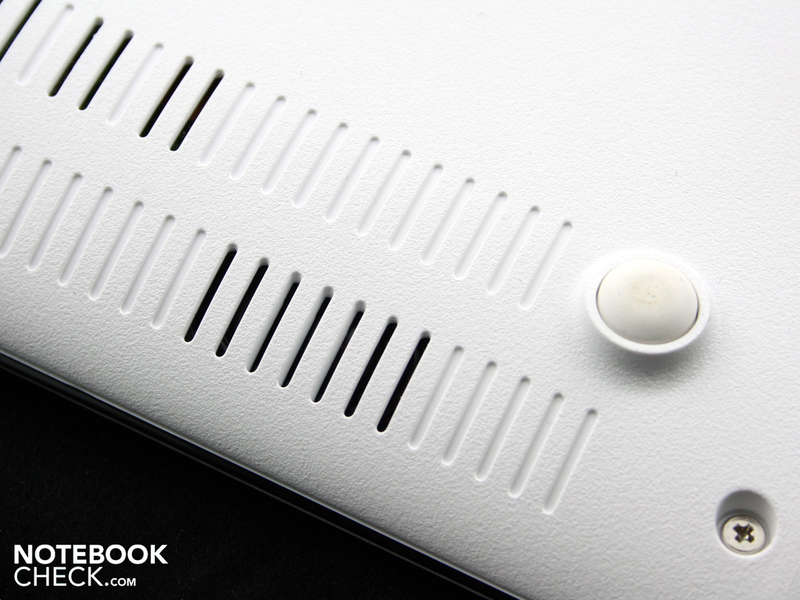 There is an active fan, but it is only just audible when the netbook is in normal use. We measured 33 dB(A). When the processor is put under stress, for instance with the Prime95 tool, the volume climbs to a maximum of 37.1 dB(A) within a few minutes. Tip: with the free eeectl tool (version 0.2.4) we could turn the fan off completely. This also works when the computer is under heavy use (for example playing videos). 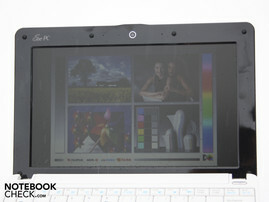 However the software was developed for the previous generation of netbooks, and does not work properly here. We could not manage to adjust the fan to different speed settings. Adjusting the screen brightness also does not work, as already mentioned. Only by running the eeectl tool in the system tray could we get the fan to turn off completely. However we have not tested this over a long period of time. The Hitachi hard drive is audible as a soft, consistent whirr. We could only hear the activity of the reading and writing heads by pressing our ears up against it. We noticed a strange effect due to the way the netbook is built - the murmuring of the hard drive gets even quieter when you lift the Eee PC 1001P up from the desk. A clear sign that vibrations are being transmitted to the desk from the computer. The netbook's temperature while in use is not far above room temperature. We measured a high of 30.8 °C (for a segment on the underside). However, the room temperature was relatively cool at 19.8 °C, which has an effect on the temperature of the surfaces. 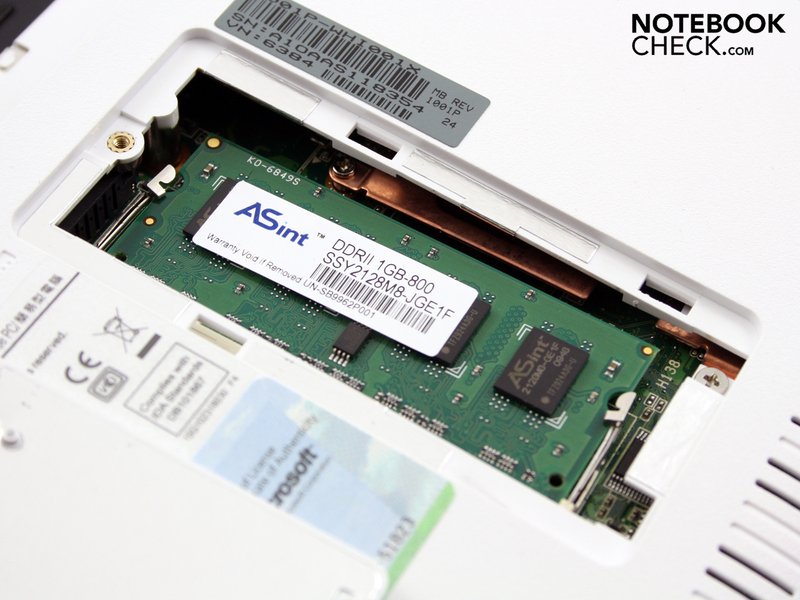 The average temperature of the top side of the netbook during a processor stress test was around 26.5 °C. If you are using the Asus Eee PC 1001P for surfing the web, reading emails or watching video clips, you will be able to enjoy pleasant temperatures of between 23 and 26 °C. The underside can reach 39.3 °C at most (in places) while the netbook is being used for these undemanding tasks. (+) The average temperature for the upper side under maximal load is 26.6 °C / 80 F, compared to the average of 29.8 °C / 86 F for the devices in the class Netbook. (+) The maximum temperature on the upper side is 28 °C / 82 F, compared to the average of 33 °C / 91 F, ranging from 21.6 to 53.2 °C for the class Netbook. (+) In idle usage, the average temperature for the upper side is 24.8 °C / 77 F, compared to the device average of 29.8 °C / 86 F.
(+) The palmrests and touchpad are cooler than skin temperature with a maximum of 27.4 °C / 81.3 F and are therefore cool to the touch. (±) The average temperature of the palmrest area of similar devices was 29.3 °C / 84.7 F (+1.9 °C / 3.4 F). The 1001P's tiny stereo loudspeakers are positioned under the palm rest area, where they send their sound down towards the table top. The sound has too much of the higher frequencies and can be characterised as 'blaring'. At higher volumes the small speaker membranes begin to buzz. With the Asus sound effect mixer we were able to correct this a little. Demanding listeners will quickly turn to headphones. The 3.5 mm headphone jack delivers a clean audio output, without noise. External loudspeakers or headphones are recommended if you want to listen to music with the 1001P. 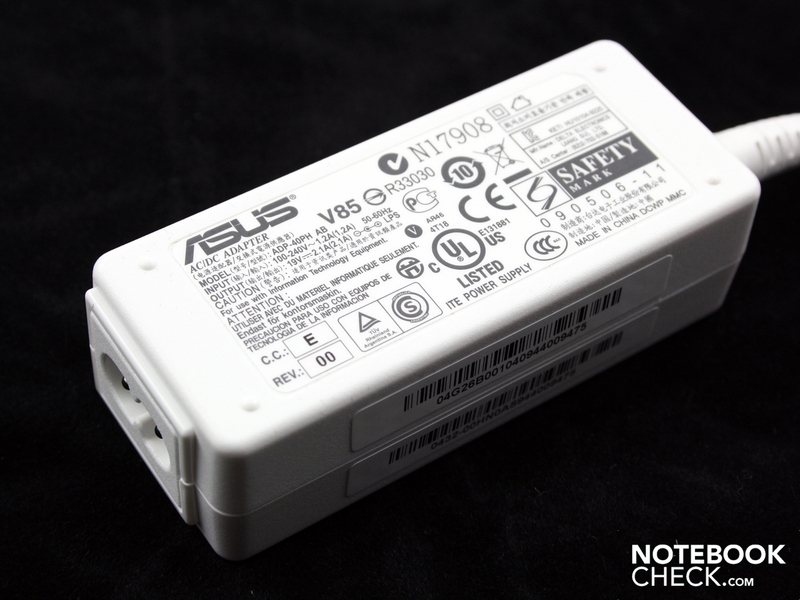 The Asus Eee PC 1001P's battery run times are impressive despite its low price. If all energy-saving options are on it can last for just over 11 hours. 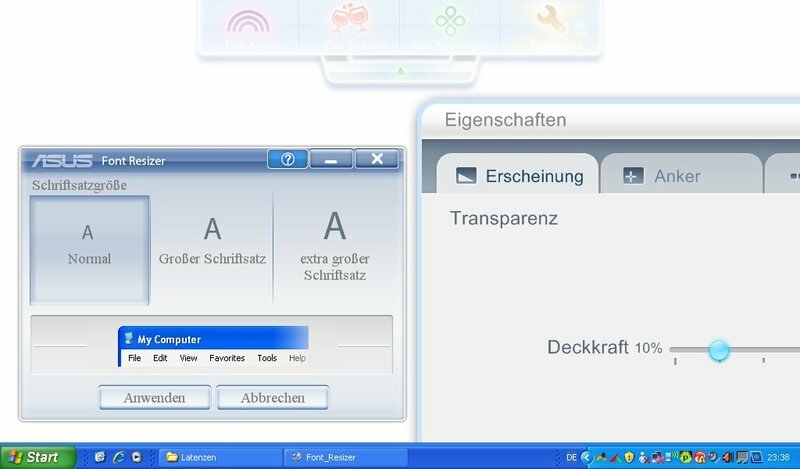 In these 682 minutes we had the computer turned on but inactive, with WLAN deactivated and the lowest screen brightness (power saving mode). The more realistic battery life test involves surfing the web wirelessly. After 6 hours (360 minutes) the battery was dead. During this time we visited news websites embellished with Flash graphics. The LED screen was on almost the highest level of brightness during this. This was necessary because the screen is very dim while on battery power, with a maximum brightness of 113 cd/m². Our battery life tests also include a test of the run time during DVD playback. The 1001P doesn't have an optical drive, of course, so we watched a video from the hard drive. The CPU usage during the test was about 50%. The video ended after almost 7 hours (403 minutes). So the battery life which potential buyers can realistically expect is between 6 and 9 hours. This is a very good battery life, which shows what can be achieved with Intel's Pine Trail platform. 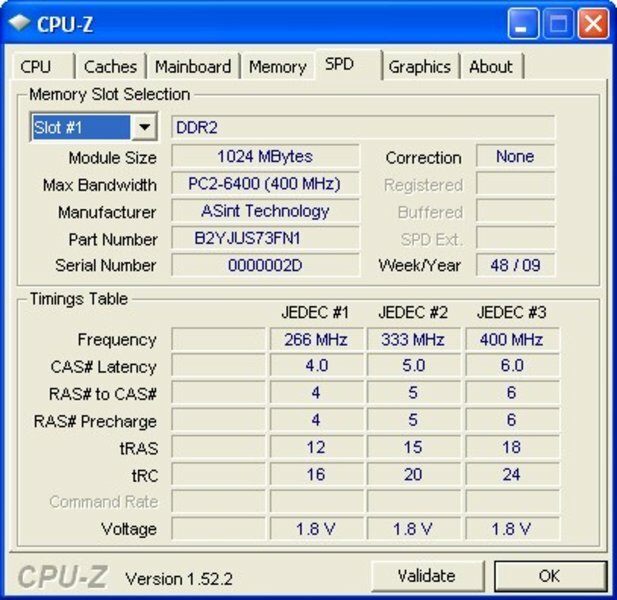 The Asus Eee PC 1001P has exceptionally low energy consumption. Even for a netbook, 6 - 9 Watts in idle is very good. 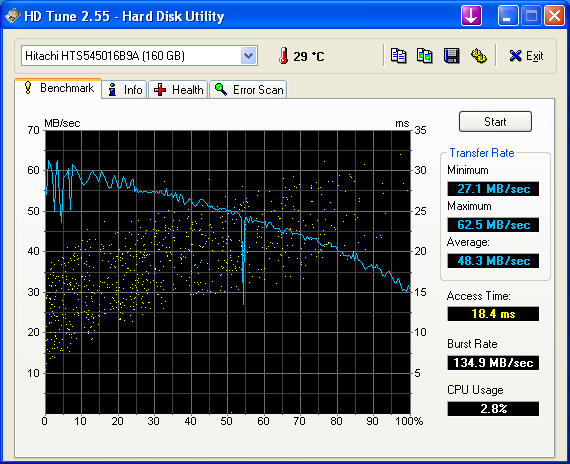 If you subject the hard drive and CPU to heavy use you can raise the energy usage to as high as 12.5 Watts. The battery was not inserted while we took these readings - when it is, charging the battery takes up 42 Watts. The battery can be fully recharged within 110 minutes with this strong energy supply, leaving it ready for the next 6-hour session. 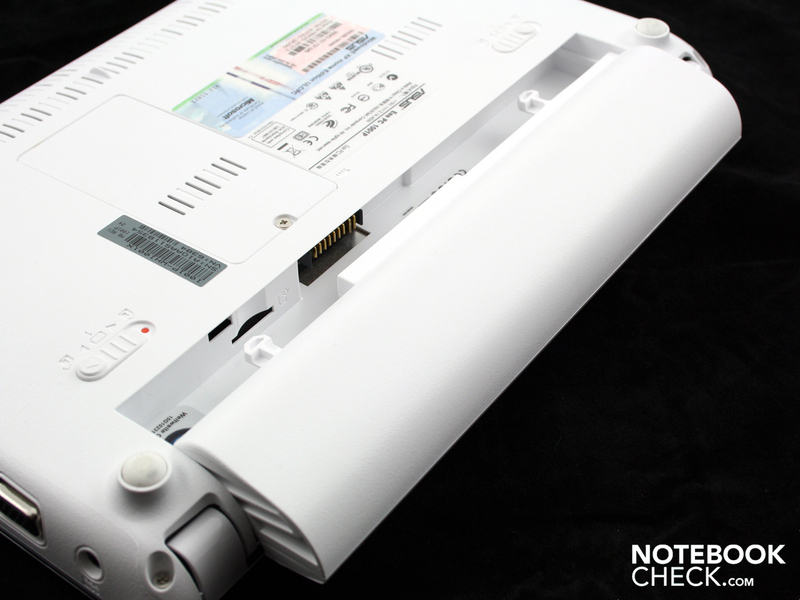 We also found the netbook to have a low energy drain in standby and when switched off. Our multimeter measured only 0.6 Watts in standby and 0.2 Watts when off. 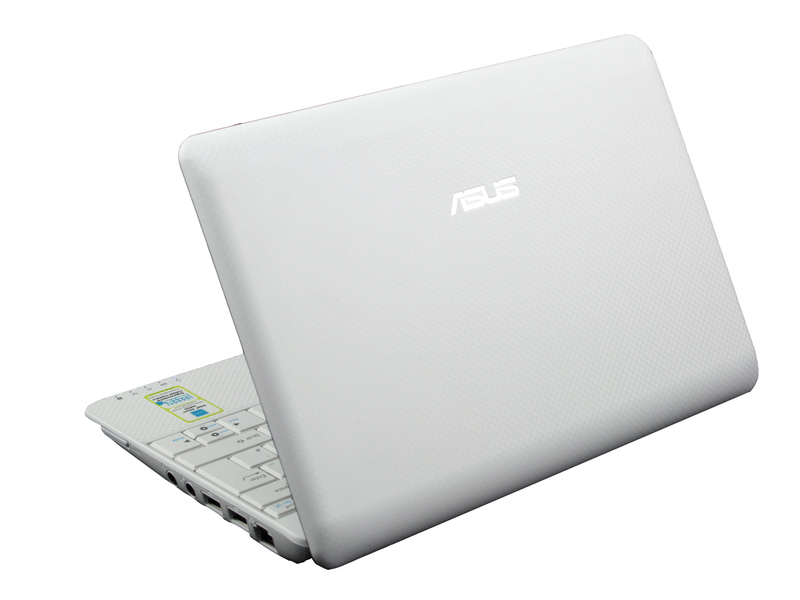 The Eee PC 1001P is the basic model of Asus's Pine Trail netbooks. It doesn't have a Bluetooth module and only has a 160 GB hard drive. But it does show us what the new netbook platform is capable of: eleven hours of battery life using all possible energy-saving options, and six hours whilst surfing the web. However, Asus has achieved such long battery life at the cost of screen brightness, which is kept artificially low. As with several Eee PCs before it, the matt display's brightness is severely limited, just to save some more Watts for the battery. This makes the screen unusable in strong sunlight. The robust workmanship of the case is a positive, as are the serviceable keyboard and the pleasant feel to the material of this 10-inch machine. The system performance, low but good enough for Windows XP, should satisfy most users. The Asus Eee PC 1001P is ideal for people who simply want to surf the web a little, chat to their friends or check emails, whilst in bed, in the kitchen or on the sofa. 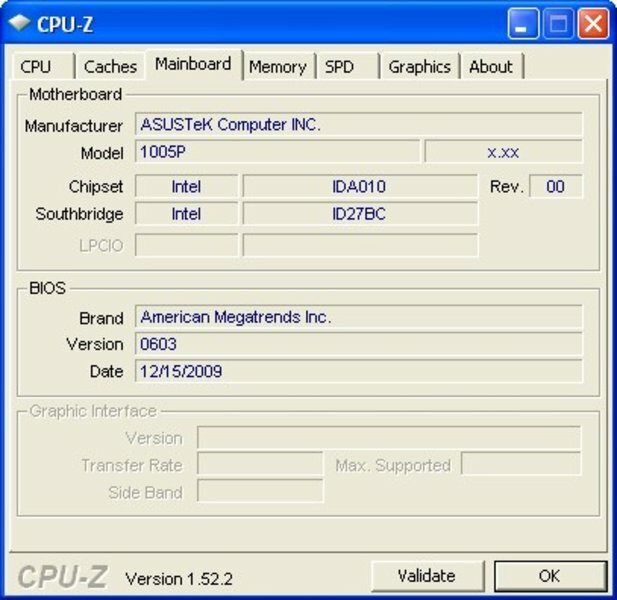 Alternatively, Asus offers the 1005PE. With a 250 GB hard drive and Windows 7, this model is technologically superior, but the screen is just as dim at the 1001P's. Those looking for something more classy which also runs more quietly might try the Samsungs N220. The battery life is of a similar length but the screen is very bright and suitable for outdoors. The Asus 1008P Karim Rashid is also a contender. The brown or pink design is more than a little extravagant, but it does sit very comfortably in your hand. 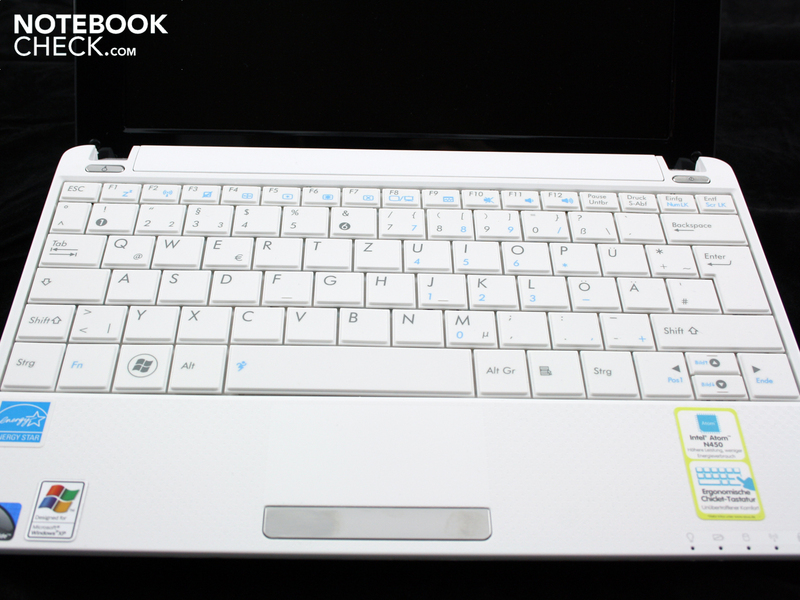 The Asus Eee PC 1001P is a 10-inch netbook, equipped with Intel's new Atom N450 processor. The sound quality is far from enjoyable. The small stereo speakers neglect the lower frequencies. Preparation for a SIM card slot under the battery. Removing the battery leaves the 1001P with a hole in the base unit. The battery is held firmly in place by two small bolts. It is easy to remove and leaves the fingernails unscathed. 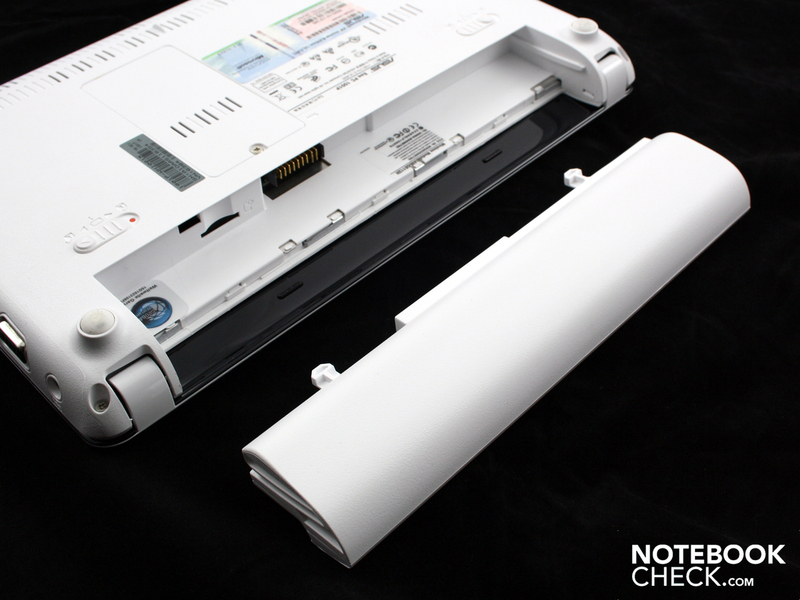 the netbook lasts for up to 11 hours without mains power. The white, 40 Watt mains adaptor is very light, at 138g. 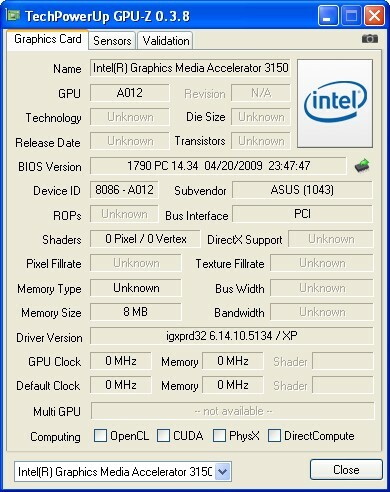 for access to a variety of Asus settings and entertainment software. On the underside of the netbook is an access panel for upgrading the RAM. There is only one slot and it contains 1 GB of DDR2 RAM. This produces images which are a little faint and have a resolution of only 640 x 480. But it is good enough for video conversations over Skype. The only glossy surface on the white netbook is the screen bezel. Shown here as delivered, with a protective plastic layer. The snow-white look can be difficult to capture in a photograph. So we have opted for a black background. The base unit and lid are robust and resistant to damage. which says that the keyboard is chiclet style. This hotkey lets you toggle between the different energy profiles. Whereas this one is the on/off button, with a blue LED backlight. 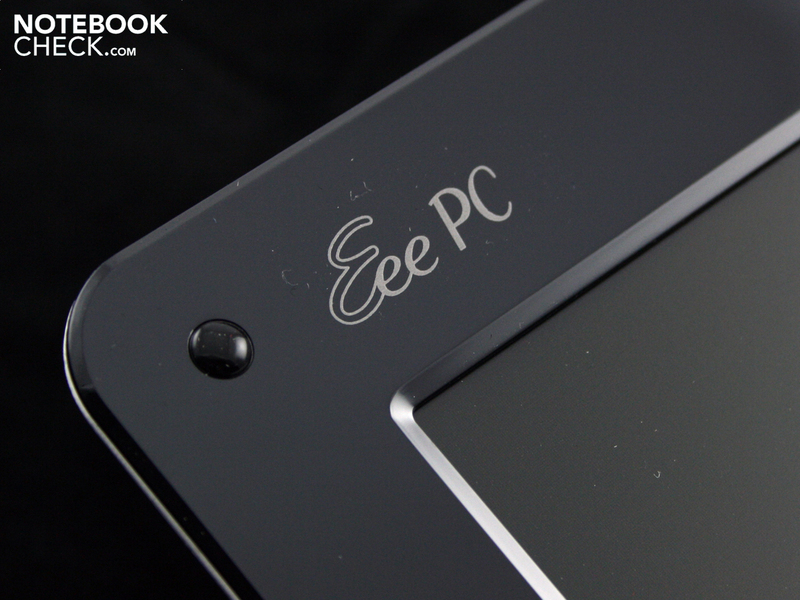 The Eee PC 1001P is fitted with a matt screen. A VGA webcam is positioned above it. 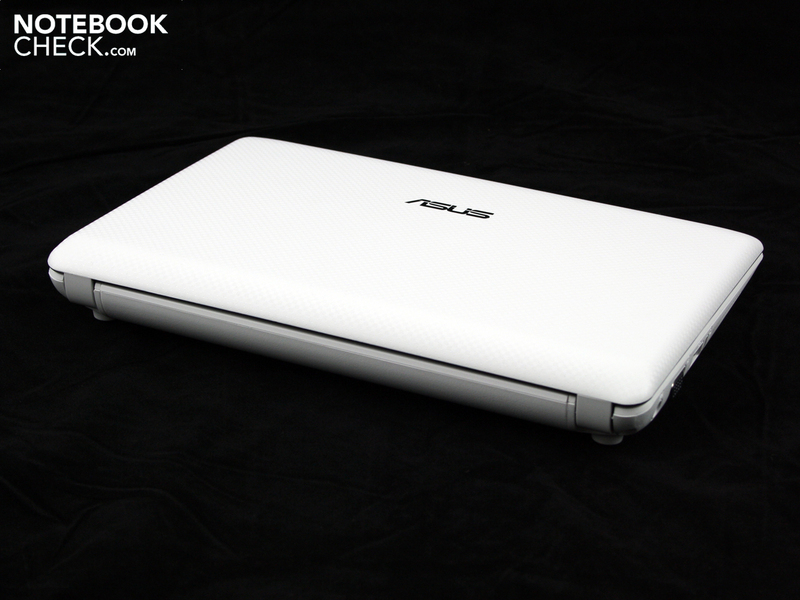 The Asus Eee PC 1001P in matt white. That they had the courage to use a matt material rather than a high-gloss one. A brighter display. We do not understand why Asus has not left it to the user to decide whether to sacrifice screen brightness or battery life. That Asus are asking such a low price for a machine with the new Pine Trail platform. The Samsung N220, with considerably better brightness. The Asus 1008P Karim Rashid with considerably more extravagance. 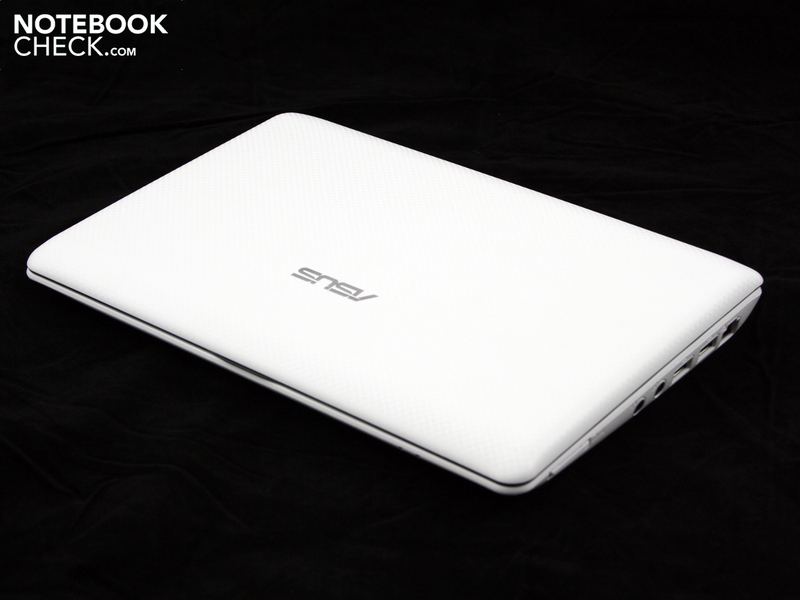 And the Asus 1005PE with Windows 7 for a slightly higher price.